As the name suggests, this large area is a University Campus designed in the 50's to solve space problems at Barcelona University and Universitat Politècnica de Catalunya. The 'Royal Palace' is a small palace, bought by Gaudí's patron Güell, who gave it to King Alfons XIII as a residence in Barcelona. Square named after Maria Cristina of Austria, Queen of Spain, wife of King Alfons XII, from 1879 to 1885. 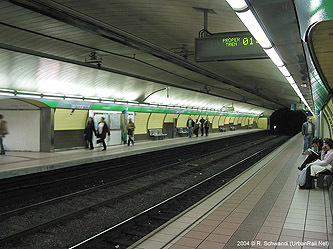 One of Barcelona's 10 city districts whose name does not refer to any courts, but to cattle enclosures in that area in the old days. 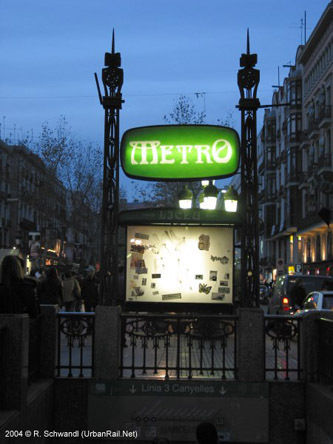 Although the name might suggest something else, it has only become a centre recently, situated on the borderline between the districts of Sants-Montjuïc and Les Corts. (1975) - Transfer to L5 - Originally called 'Roma-Est. 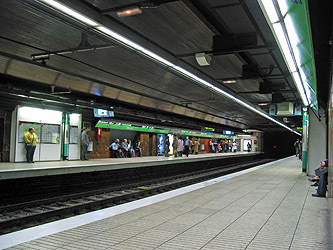 RENFE' it was renamed when the new modern central railway station was built for the Football World Championship in 1982 in Spain. Street named after the Catalan city of Tarragona, a Roman settlement, Tarraco, actually capital of the Roman province Tarraconensis, which covered more than half of the Iberic peninsula. This huge round square was designed for the 1929 exhibition which took place at the Fair Centre nearby. Originally called 'Parlamento' after an adjacent street, it became 'Poble Sec' in the 80's which is the name of the neighborhood between Avinguda Paral.lel and the Montjuïc mountain. The name actually means 'dry village' , maybe because it's higher and therefore cannot be flooded. See L2 for details. 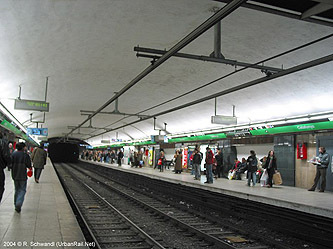 From 1975 until 1982 passengers had to change here between line 3 and line 3B due to different systems of power supply. 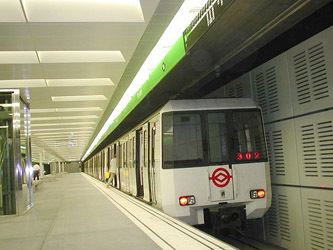 The former platforms of line 3B are now used as a terminus for L2 (Purple Line) making it the most comfortable transfer station of the network. 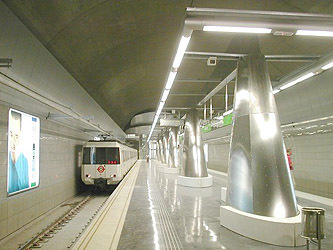 Substituting the former station of 'Fernando' further up the Rambla, this station is called after the medieval shipyard next to it. Originally called 'Atarazanas' - 'Drassanes' in Spanish. Called after the adjacent opera house 'Liceu' which was built by J.O. Mestres and M.Garriga i Roca and originally opened in 1847. It burned down for the first time in 1861 and again in 1993, being currently rebuilt. Huge central square built as a bridge between old and new town and obviously named after the country of which Barcelona is the Capital. 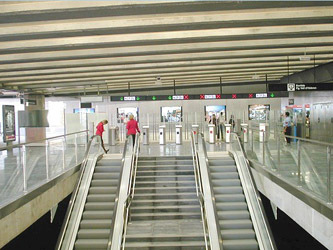 There are actually 4 stations underground: L1, L3, the terminus station for the FGC urban and suburban lines (5 platforms) and a RENFE Suburban Rail station situated between the two L1 platforms. 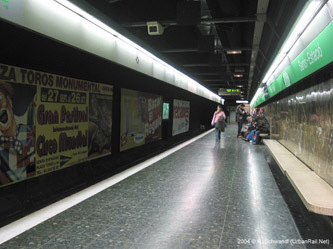 From this station, which was originally called 'Aragón', a branch went down Via Laietana to 'Correos' until Line 4 (the yellow line) became 'independent' in 1973. 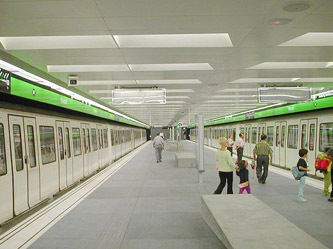 Today this is the only station in Barcelona serving three metro lines (though the L3 station is quite a walk from L2 and L4). 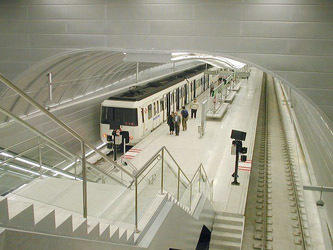 There is also a RENFE Suburban Rail underground station. See L2 for more information. 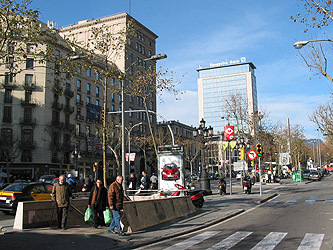 Ildefons Cerdà designed this avenue diagonally through Barcelona. The upper and lower parts of Av. 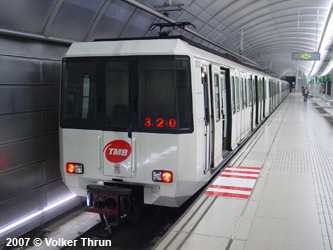 Diagonal are now served by trams, with the two separate networks to be linked in the mid-term future. Before the area was built up, there was an estate called 'La Fontana' (the fountain), not existing any longer. Square dedicated to Ferdinand-Marie de Lesseps, whose company financed the construction of the Suez Canal, and who was consul of France in Barcelona from 1842 to 1848. The name of this neighborhood actually means 'a very steep valley' - and that's what it is (between Carmel and Putxet). Area called after places of repentance. Some hermits established themselves around the neighborhood in the 19th century. This neighborhood which houses Barcelona's biggest hospital complex, has got its name from an ancient monastery, Sant Jeroni de la Vall d'Hebron, referring to the biblical valley of Hebron in Palestine. 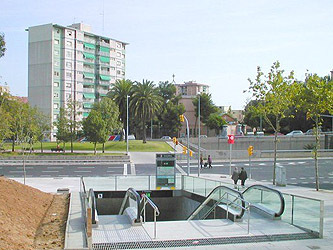 New neighborhood in the 'Hebron Valley', part of the district of Horta-Guinardó. The name could be derived from an ancient house called Gombau. 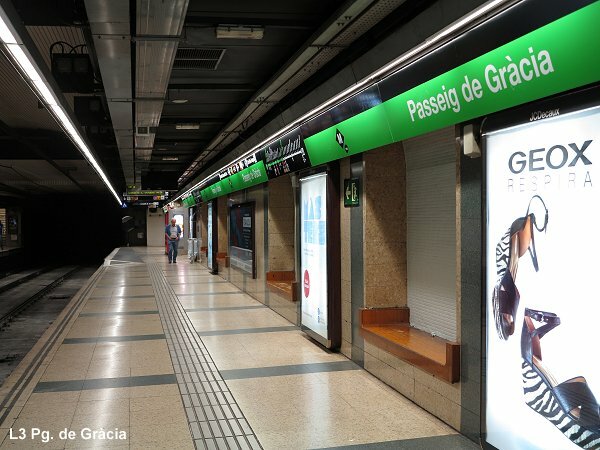 Until Oct. 1999 the name Roquetes which is a neighborhood on the foot of the Collserola mountain range that surrounds Barcelona from north to west, was used for the present Via Júlia station on line 4. The name actually means 'small rocks'. 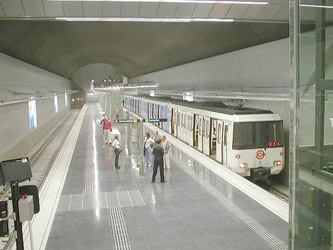 From 1975 until 1982, the section between Zona Universitària and Paral.lel was operated separated as line 3B.